1. Sink your weight onto right foot, and place left foot to your left side so feet are shoulder width apart with left toes pointing forward; then distribute weight evenly on both feet and adjust right toes so feet are parallel, keeping knees slightly bent and arms slightly curved at your sides with palms facing backward. 2. Bend knees slightly as you bring hands back-to-back in front of body. 3. Turn fingertips inward toward body and then upward toward the sky. 4. Straighten your knees slightly as you continue raising arms upward and turn palms first toward each other and then forward with thumbs and tips of forefingers touching. 5. When backs of hands are in front of face, raise your arms up and forward as if starting a dive and dip your head between your arms. 6. 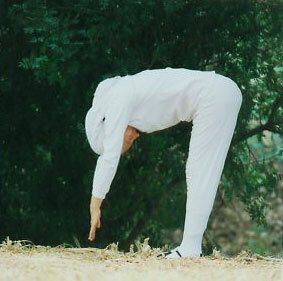 Arch forward and downward with your extended arms, and bend your knees as you bend over vertebra by vertebra lowering fingertips toward the earth. 7. Just before fingertips reach the ground, straighten your knees until they are only slightly bent to form a Chet with head between arms, crown toward the earth. 8. Bend your knees and point fingertips inward toward your legs and then upward with hands back-to-back. 9. Slowly unfurl your back vertebra by vertebra and gradually straighten your knees until they are only slightly bent as you continue to raise back-to-back hands until your body and head are in an upright position and fingertips are in front of chest pointing toward the sky. 10.Begin to lower your arms slowly and when fingertips are at waist height, let arms separate to the sides, keeping elbows slightly bent, and turn palms toward the back with a circular motion until they come to rest at your sides with fingertips pointing toward the earth. 11. Repeat full sequence from Step 2 eight more times, ending the last sequence by shifting your weight to right foot and bringing left heel next to right heel in Step 10 as arms separate to the sides, and then balancing your weight evenly on both feet as hands come to resting position at your sides. 12. Repeat full sequence nine times starting on the opposite side by sinking weight onto left foot and placing right foot to your right side. Chet forms a gateway to eternity. As gravity pulls arms downward. Like angels moving on a ladder formed by the human arch. Until the heart rejoices in a newly erect body filled with gentle strength. Drawing that strength deep within the recesses of the soul.